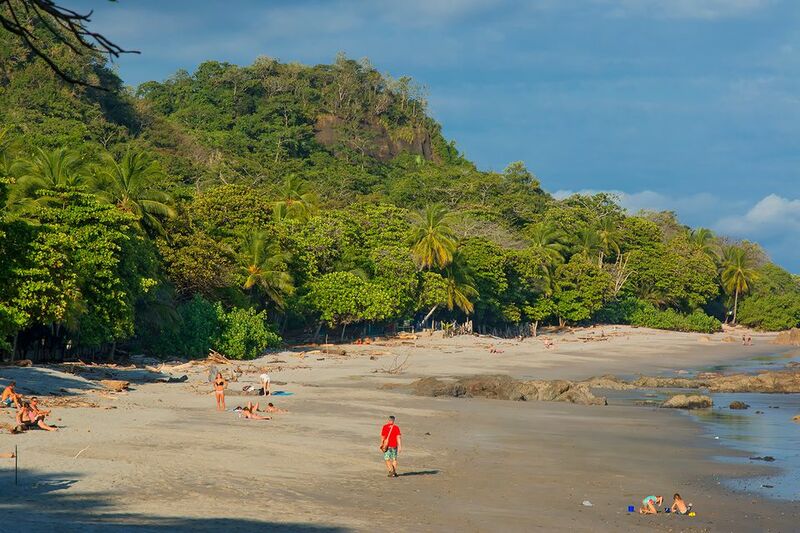 Costa Rica beaches are among Latin America's best. Think about it: when someone says, "Costa Rica," you probably think, "fantastic beaches!" Right? Warm waters year-round, an unparalleled tourism infrastructure, and limitless attractions spanning two coasts are the reasons Costa Rica beaches rank among the best in the world. And since nearly two-thirds of Costa Rica's borders are coastline, there are a whole lot of Costa Rica beaches to explore. Let's get started! Okay, obviously the Nicoya Peninsula isn't a single Costa Rica beach. But Costa Rica's largest peninsula is ringed by so many blissful strips of sand, it deserves a top ten list of its own. Besides livelier beach cities like Montezuma, Tamarindo, and Mal Pais, Nicoya boasts many Pacific beaches that are far more remote and relaxing: Playas Hermosa, Samara, Flamingo, Conchal (pictured at right), and Playa Grande. Manuel Antonio is not only one of the most beautiful Costa Rica beaches, but one of the most beautiful beaches in the entire world. Imagine: perfect horseshoe bays bordered by soft white sands, dazzling blue-green waters, and hilltops piled with jungle and streaming waterfalls. Dive, snorkel, surf, kayak, hike, or zipline -- but don't forget to relax and enjoy the unforgettable views. Playa Dominical, about 30 miles south of Manuel Antonio National Park, is widely recognized as one of the best Costa Rica beaches for surfing. A number of surf camps and surf shops have sprung up to take advantage of the lively lefts and rights. But even if you don't surf, you'll adore Playa Dominical's lush green landscape, nightlife and relatively uncrowded sands. Located on the inner base of the Nicoya peninsula, Montezuma is a gathering place for Costa Rica's most idiosyncratic locals and travelers. Dreadlocked Rastafarians, tattooed bohemians, sun-kissed surfers, and other examples of exceptional beauty are the norm at this picturesque little beach, which also boasts tide pools, forested waterfalls, and wildlife (Capuchin monkeys! Crocodiles!) viewing. At the helm of Costa Rica's Caribbean side, Tortuguero is a eco-tourist's fantasy. Travelers can experience any number of outdoor attractions, including tours down jungle canals in dugout canoes, scenic hiking trails, guided safaris. Sixteen of Costa Rica's endangered animal species live in the Tortuguero National Park, like tapirs, ocelots, manatees, and green sea turtles, after which the region is named. To top it all off, Tortugero's beaches are perfect for sunbathing. While Playa Tamarindo offers world-class shopping, dining, and coastal amusements, budget travelers might find themselves priced out (when I traveled there in college, I grocery shopped and cooked in a communal kitchen). But Tamarindo's natural perks make the splurge worth it -- on the beautiful beaches adjacent to Tamarindo, giant leatherback turtles (and other types) annually clamber ashore to lay their eggs. Corcovado is the jewel of Costa Rica's Osa Peninsula. Its beaches are windswept beauties, with dark sands shaded by towering palms, while the mountainous inland jungles of Corcovado National Park are home to some of the country's most distinctive wildlife. No trip to Corcovado is complete without a boat excursion to the nearby Isla del Caño, which offers fantastic diving as well as the opportunity to examine the island's ancient stone spheres -- spooky! Surf culture is the principle philosophy in Mal Pais and its coastal neighbor, Santa Teresa. If you're not a wave-worshiper, book a boat tour and watch dolphins, manta rays, and other creatures thriving in the area's protected waters. Travelers can also hike to the Montezuma waterfalls and take a flying leap, or conquer the 4-hour trek through the Cabo Blanco Nature Reserve to its pristine, white sand beach. However, Mal Pais's own beaches are even better for stringing up a hammock and swaying in the sun. South of the port city of Limon (towards the Panama border), a number of stunning beaches are the personification of the low-key Caribbean lifestyle. The Cahuita National Park is an excellent place to camp -- if you don't mind waking to the sound of monkey chatter! Travel farther down the coast and enjoy dramatic sunrises at Puerto Viejo. Or head straight to Manzanillo, a protected area with tropical rainforest, palm swamps, coral reefs, and of course, idyllic Caribbean beaches. Right in the center of Costa Rica's Pacific coasts lies Jaco Beach, a surfer's mecca with no shortage of attractions for travelers. Jaco is in such close proximity to San Jose (2 hours by car), it flourishes with nightlife, international dining options, and even casinos. But because of the budget surf crowd, accommodations and amenities span the entire price spectrum -- at Jaco, no one is left out. Northeast of Montezuma, Tambor's crescent-shaped bay (called Bahia Ballena) was once frequented by whales. Now, it's frequented by travelers -- enough to keep the gentle giants out at sea, but not enough to drive them away completely. The bay's mild waters make it one of Costa Rica's best beaches for swimming and snorkeling. Tambor's inland areas are fun to explore on horseback, while its pinkish-gray beaches are perfect for a barefoot stroll. Boats also launch from Tambor to the Tortuga Island, home to immaculate beaches and unparalleled Scuba diving.